certutil -encodehex -f strings64.exe strings2.hex 2 - pure binary - pointless according to me. I think these are all. I (still) don't know how X509 can be decoded. I just noticed that "certutil -encodehex -f strings64.exe strings8.hex 8" doesn't give "base64 - x509 with headers", but does the same as "number 4" ("in columns with spaces , without the characters and the addresses") at least on my win10. I ran a bunch of tests on Windows 10 with various flavors of -encodehex, and here is what I found. 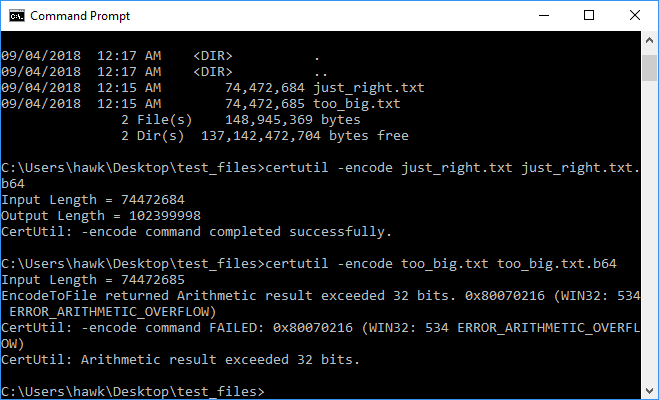 CERTUTIL has a surprisingly low limit to the size file it can encode/decode. I'm not sure about the exact value, but the encode limit is only in the tens of millions range. CERTUTIL accepts both decimal and hex notation for the type argument, but not octal. Since octal is not recognized, it is safe to prefix any decimal value with zeros. 0x40000000 bit - The output is encoded on a single line, without any line terminator. Depending on the format, the result may not be able to be decoded with CERTUTIL. Documentation states this flag is not supported by XP. Note that CERTUTIL only accepts positive numbers, so the type value cannot be computed by SET /A, else it will be converted into a negative value. It is best to specify a type with this flag using hex. The 0x80000000 and 0x40000000 bits can be ORed with any of the values documented below. Unless the 0x40000000 bit is set, any -encodehex result can be decoded using either -decode or -decodehex (whichever is appropriate). Generally, each line of output represents 16 bytes of input (except for the last line). The hex pairs are delimited by spaces, with two spaces between the 8th and 9th bytes. If the 1 bit is set, then 3 spaces are appended to each line, followed by the ASCII string representation, with control codes and non-ASCII bytes represented as dots. If the 2 bit is set, then the hex address is prepended. The address is always represented with at least 4 hex digits (possibly left 0 padded), and followed by a <TAB> character. Generally all encodings are identical, with 64 bytes per line in the output, and = padding appended as needed, regardless which type is chosen. The only thing that changes is the format of the beginning/ending headers. The only exception is the undocumented 0xD type. 0x9 - X.509 CRL headers. Note that no encryption is done, it simply changes the header. Through trial and error, I've determined that the limit is 74472684 bytes. I'm guessing that there's an output file size threshold of 100000000 bytes. I thought I remember reading somewhere it was roughly 75MB. It's possible that your mileage may vary, but I don't know why it would. Indeed. It seems that the limit for encodehex is 21510272 bytes.